The Irish Government needs to increase the tax by €3 billion to fund a fair and equal society. The money can be raised from measures such as a minimum effective corporate tax rate of 10%, a financial transactions tax, eco-taxes, and increasing the minimum effective tax rates on high earners. Tax is a dirty word in Ireland. Raising taxes is politically toxic while cutting them is a popular at election times, according to Social Justice Ireland (SJI) which argues in a new book, that the Irish Government needs to increase the tax by €3 billion to fund a fair and equal society. “We want to chart a course to a better Ireland, that is what this book is about. At the foundation of that is how we raise taxes and how much tax we raise. We are a low revenue economy, yet we are one of the richest countries in the world. 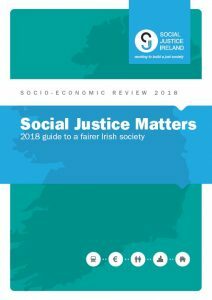 It should be a priority to find those additional resources, not to squander the resources we have,” said Seán Healy, CEO, SJI, who was speaking on the occasion of the publication of its annual Socio-Economic Review Social Justice Matters: 2018 guide to a fairer society. The book by Seán Healy, Colette Bennett, Sara Bourke, Ann Leahy, Eamon Murphy, Michelle Murphy and Brigid Reynolds, highlights how Ireland needs more tax revenue, not less, especially in uncertain economic times, and in order to fund decent public services, upgrade ageing national infrastructure and this ensure Ireland becomes a fairer and more equal society in the future. It argues that the money can be raised from measures such as a minimum effective corporate tax rate of 10%, a financial transactions tax, eco-taxes, and increasing the minimum effective tax rates on high earners. “We need to collect sufficient tax to ensure full participation in society for all, through a fair tax system in which those who have more pay more, while those who have less pay less. With this book, policymakers have a guide for how that can be done,” said Eamon Murphy, Economic and Social Analyst, SJI. The proposals in the 300 page Social Justice Matters are just part of an analysis and guide to issues of social justice in Ireland. They aim to challenge citizens, opinion-formers and policymakers to imagine how a fairer society can be achieved. The book advocates a new guiding vision to shape the future direction of Irish society – a new Social Contract. The Social Contract is a philosophical ideal and according to original theories involves individual citizens knowingly submitting to the authority of the State in exchange for protection of certain basic rights. Despite economic and social progress in the century since the formation of the State, Ireland has never delivered to its citizens, public services and social infrastructure equivalent to that of other countries of Western Europe. This is according to the authors who add that in its early years as a State, Ireland was underdeveloped without the economic capability to raise the revenue necessary to do this. Nowadays there is no good reason, except lack of political will or understanding, why Ireland should not be capable of delivering public services and social infrastructure equivalent to that of similarly developed economies in Western Europe (i.e. the EU15). It is predicted that Ireland’s level of public investment will be 2.1% of GDP in 2018 (Department of Finance, 2017). This is well below the European average and would put the country ahead of only Spain and Portugal, according to the most recently available figures (Eurostat, 2018). “Such levels are certainly not sufficient, given how we have trailed most of our European counterparts in capital spending for years,” state the authors. The Ireland 2040, and the National Development Plan (Department of Housing, Planning and Local Government, 2018) need timelines and targets for investment. – the gap between the living standards in rural communities (with consistently lower income) versus urban areas. – the need to recognise people’s right to meaningful work. – a Basic Income System as many skills and jobs become obsolete and in changing demographics. – that global companies behave with the interests of society in mind and pay their fair share of tax. Tags: Ireland 2040 the National Planning Framework (Department of Housing Planning and Local Government 2018), Sean Healy, social contract, Social Justice Ireland, Social Justice Matters: 2018 guide to a fairer society.